January is here and boy are we feeling the buzz of a new beginning. Ladies in our circle are charged up and ready to ROCK this year! It’s January, it’s generally colder (where we are anyway) and we are coming off the crazy of the holidays. It’s time to shed the heavy energy holding us back and spring forward into this New Year energy and use it to our advantage. Try these 3 yoga poses to unleash and unlock the front of the body and open up the heart and hips! Enjoy feeling energized, open and ready to tackle whatever comes your way! This is an absolute favorite Emaya pose. When we practice this pose we feel strong, balanced and open! This asana provides an awesome stretch in the psoas and hips while strengthening the quadriceps and gluteus muscles. Practicing this pose develops balance, core strength and determination: a perfect combination to kick off the new year! To practice this pose root your right foot into the mat and step your left foot back then drop your knee behind your hip. Gently root the top of your back foot down into the mat and energetically drawing the foot back in space WHILE urging your front shin forward. Draw the inner thighs towards each other and upward. 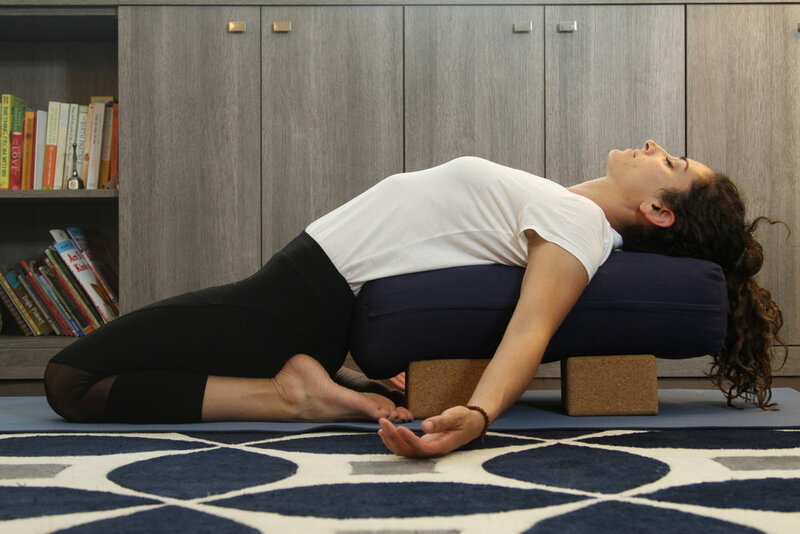 Find containment in the ribs and let energy rise out of your hands reaching high (note: keep your hands on blocks around your foot if you are new to this pose or you feel unsteady). Breath into all the physical and energetic sensations 2-5 mins and then be sure to switch sides!! Saddle pose is such a great release and stretch for the entire front of the body. It’s wonderful to open the hip flexors, the ankles and stretch the low back. Start seated on your heels then separate your feet wider than the hips, knees hip width apart. If you can sit your tush the whole way to the mat with sensation vs pain, then stay there! If it is way too much sensation for you or it is painful for your knees or ankles, use a prop like a block or two under your tush. Also, a blanket could be nice under your knees. If your tush is on the ground you can lean back onto a bolster (or all the way down to the floor). If you are sitting on blocks, lean back on your hands or elbow/forearms resting on a bolster behind you. Stay here anywhere from 2-5 minutes, breath and let go! Open up and shine in this pose. This pose is not so easy but very rewarding in many variations! Come to your knees and place your hands at your lower back to remind yourself to stay long and supported there. Tuck your toes under to get your heels higher for your hands to reach to OR if you know and love this pose you can keep the tops of your feet on the mat. Take a deep breath in and out and open your heart to the sky with your throat and chest open. Stay here if that is enough sensation! If you can go deeper, anchor your shins, draw your tail towards the pubic bone (not a tucking but a drawing down and forward to protect the lumbar) as you gather the thighs inward and connect to their strength. Find containment in the ribs- don’t let them jut out to the sky, draw the front of the pelvis upward and the same with the lower back ribs- lift upward away from the pelvis. Press your shoulder blades against your back ribs all as you walk your hands down the backs of your legs and reach for your heels (with toes tucked or untucked). Breathe, breathe breath and trust. See how long you can stay here and then gently with control walk the hands back up the legs and sit back on your heels to contemplate this experience! A child’s pose or seated forward fold will be a nice counter to all of these heart opening poses! Enjoy! Sunday Reflections: Honoring Martin Luther King Jr.